How can anyone resist that puppy face? My heart had been broken with the too-short time we had with Cooper. In case you missed it, you can read about it here. Two weeks after my declaration, Rocky arrived at our house. 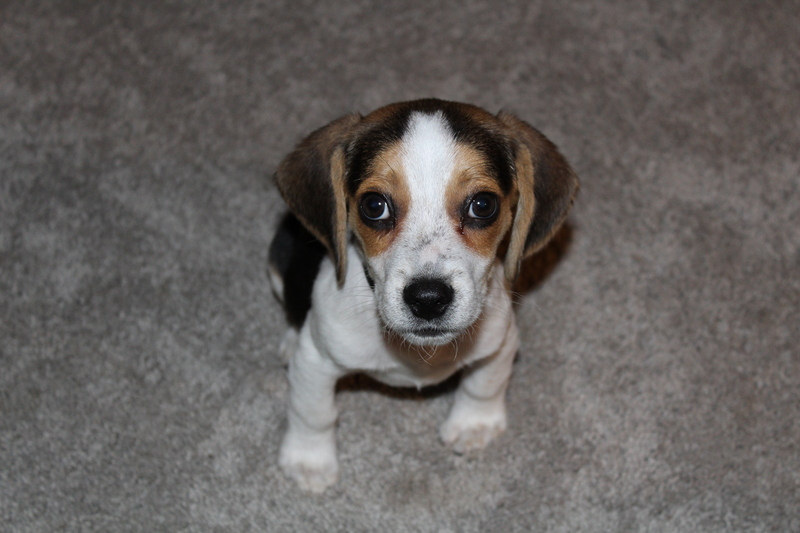 This beagle puppy was just as adorable as Cooper and everyone was instantly in love. Again. The family was on hyper alert this time. My son, Spencer, took him to the veterinarian within a day and had his first round of shots, as well as worming medication. We monitored his bowel movements, his food and water intakes. Rocky, as in Rocky Top, the unofficial fight song for my son’s favorite college, the University of Tennessee, seemed to be aptly named. He had a rough start. A tapeworm and coccidia both called for vet visits. He refused to eat his food but gobbled up the cat’s food anytime he could. Another trip to the vet revealed Rocky had coccidia again. This time we were educated about how to prevent it. The cat food problem was solved when I purchased the expensive puppy food and we were on our way to a typical puppy. Our long-eared pup has learned how to sit and stay. He is not housebroken yet, but he’s getting close. He loves to sleep in my lap, in the crook of my arm or snuggle by my neck. 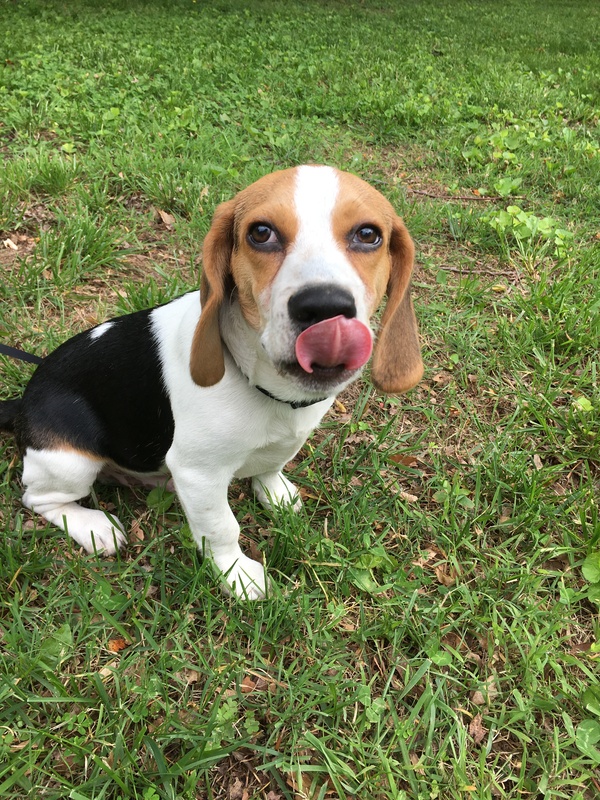 As a hound, he eagerly sniffs his way around the yard. Rocky likes to bite an object while he shakes his head violently and his ears smack his face. He has much more to learn. How do you train a dog? In this information age, there is no shortage of knowledge or methods. I’ve googled dozens of articles. My household is somewhat divided over techniques. However, over a decade ago I remember watching a TV show that emphasized the three most important things when training a dog: patience, persistence, and praise. Rocky, in May, licking up something he probably shouldn’t have been eating. Of course, when training a puppy, it’s good to remember to be patient. It takes time to change behavior and it doesn’t help the process when you’re impatient or worse, angry. I began writing this post at the end of February. I was calm, cool and full of patience. Now it’s three months later and I’m more chaotic than calm, more cross than cool and my patience is wearing thin. Don’t give up. Be consistent. Just because the puppy doesn’t get it the first few times, you mustn’t stop. In February I was determined. In June I’m just dismayed. Everyone loves praise, including dogs. At first, praise is usually in the form of treats. Eventually, treats should get smaller and words of encouragement become larger. In my opinion, using encouragement works far better than punishment. Treats and lots of “good boy” flowed in February. June has brought more “bad dog” than good, but the treats have remained about the same. Why have I remembered those three tips? Because those three traits resounded with me regarding my spiritual training. Patience. Persistence. Praise. I started to outline how each relates to spiritual life, particularly mine, but how about you think about how they relate to your spiritual life? Meanwhile, I’ll be trying to practice more patience, persistence, and praise with Rocky. Good ol’ Rocky Top. Thanks, Susanna! We’re on the right track. It just feels like a very slow pace.